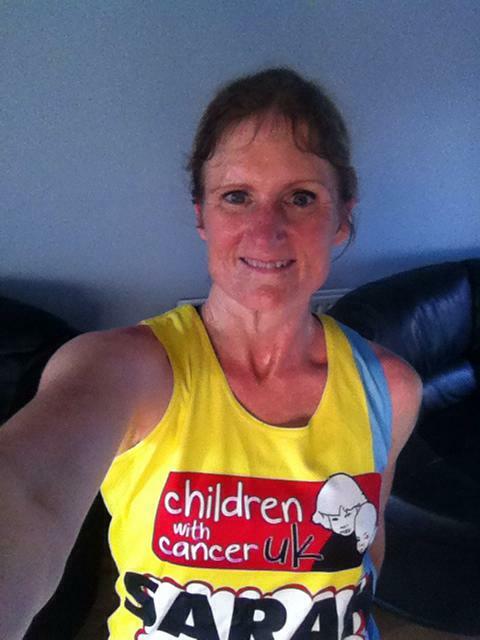 Sarah's Marathon - Just over a week to go! The big question then! How is the training going? The truth is, it is an absolute roller coaster. A continuum of ups and downs of emotion, energy and progress. You just hope that the final run, on the day, is an up-sort-of-run! Having only partly followed a plan for my first ever half before, I pulled a plan off the internet for 16 weeks, which rather conveniently started after Christmas! I was very much in the excitement zone, keen on the journey ahead of me and the expected sense of pride I would feel if I could do it. I transferred the plan onto our calendar and my youngest daughter gives me a sticker each day when I have completed it! Having it written out gave me the control I needed and broke it up into small sections. The 22 miler in April was pretty scary to consider but at the time it was months away so something to ignore for now! I don’t think I missed a single session in January. I was fired up, the distances were all attainable and did not push me too much and my body soon got into the pattern of doing something each night. Some sessions were an amount of miles, some were a length of time, some at easy pace and some speed. I was enjoying having a link to the iconic Virgin Money London Marathon. January was an up. February was a little different. By this time my body was getting a bit tired, the distances were longer and the timed sessions now required me to go further as I was speeding up. The mental strength needed to run past my house as I got back 5 mins early was draining in itself. For some reason, rather than thinking the last 100 yards were great as I was near the end, I got to a particular point and wanted to stop and walk but it was not fatigue that was stopping me. When the end was physically in sight, my focus was gone and my mind took control of my legs. I had to force a sprint finish most times as it was either that or walk. The other big mental block was the Saucony Cambridge half marathon that I had entered for the first weekend in March, which was feeling like a big mistake. Cambridge was a problem for me, or rather it was a problem for my competitive streak. I have not set myself any targets for a time for the marathon. However, I had mentally set a sub-two hours for Cambridge. The only way you can run faster in a race, is to run faster in training. This was against the plan though which had short speed runs and longer ‘easy’ pace runs. However, I was fixated on the time and could not drop it, even for the ‘bigger picture’ as others kept telling me. This meant training was becoming tough. I was not getting anywhere near the magic 9:09 pace needed and felt like a half was going to be hard enough let alone a full one. This was demotivating and getting out in the evenings without the rush of the sense of achievement was chipping away at my energy levels. Race day came and I did not look at the weather report – rookie error. About 60 mins before the start gun it started to rain and I had all the wrong clothes on. I was frozen, the field was muddy and there was nowhere for the warm up run. In fact, I did not complete a warm up at all bar running on the spot to keep warm. In the end I ran with my hoodie on, which of course by mile 2, it had stopped raining and I had to carry it around my waist for most of the run. Needless to say I did not get the sub-2, I was 1min 44 secs out (but I did get a medal!). At least I could now focus on the distance. My next challenge was 18 miles the next weekend. My brother was going to run this with me for moral support. This was a great run. After the disappointment of Cambridge, it was good to feel in control again. The weather was good, we managed to maintain a steady pace, only altering about 10 secs throughout and at the end as I ran the final stretch home I could not stop smiling. I had just run 18 miles and the marathon felt possible again! Until the following weekend when I had to do 15 miles and every mile after the first 4 was tough. I don’t know why, may be running on my own again, maybe I did not hydrate enough the day before, maybe I started too quickly. Likely to be all of it. Another runner in the club has said ‘You have to accept the hard ones as they make you appreciate the good ones’. This is what I am taking from the hard runs. The day before Easter camps opened I had the big 22 miler to go. Having learnt from the recent bad one, I was determined to start steady, drink and eat properly the day before and warm up fully. I also recruited company in the form of my family who rode alongside me for most of it, which was really needed for the last 4 miles. However, I did it and even managed to walk up and down stairs the following day! I am now on the taper, gently running the distance down before the big one. As some club runners ran the Brighton marathon at the weekend it is feeling very real. Sunday 23rd April, 6am bus booked, I’ll let you know how it goes!